Each year about this time, I start getting emails about holiday cookies. Many of them want my favorite sugar recipe and others are about things like how to keep cookies from spreading in the oven and keeping their shape. When it comes to getting the perfect sugar cookie I’ve got a few tips. You’ll notice that my sugar cookie recipe has no baking powder in it and there are basically two reasons for that. First, the baking powder causes the cookie to puff and spread when they’re baking. If you have an intricately shaped cookie, you’ll lose some definition. Sure, your cookie will be a little more dense, but I bet you won’t notice much. Also, I’ve found that the cookies without baking powder are easier to decorate because they don’t break as easily. The other thing that I can recommend about creating the perfect sugar cookie is keeping the dough COLD. I make my dough and then wrap it in wax paper and refrigerate it for at least an hour (but preferably longer). Then I break the dough into quarters and only use a small amount at a time, keeping the other dough in the fridge. Keeping the dough cold will make them easier to cut out and transfer to a baking sheet. If you’re dough gets too warm and starts stretching and tearing easily, just ball it up and put it back in the fridge. Also, be sure to allow your cookie sheets to cool before you use them again. Otherwise, the cookies will start to spread before they make it into the oven. When decorating, I prefer to use royal icing because of the taste and because it sets up hard so you can stack the cookies. I simply mix it up, divide into bowls, color it with gel based food colorings, and then decorate the cookies with a piping bag and assorted colored sugars. In a large bowl, cream butter and sugar together until smooth. Add eggs, extracts, and salt, mix well. Add the flour gradually, stirring well. Cover or wrap dough and chill for at least an hour, but preferably overnight. Divide dough into quarters and work with one quarter at a time, keeping the other refrigerated. Roll out on floured surface to about a 1/4 thickness. Cut into shapes with your favorite cookie cutters. Transfer cut-outs to a cool cookie sheet lined with parchment paper or a silicone baking mat. Bake 6 to 8 minutes, or until set but not browned. Cool and decorate with royal icing. In a large bowl, beat together whites and vanilla. Gradually add powdered sugar, mixing well. Once all the sugar is incorporated, beat for two minutes on high or until smooth and glossy. Color using gel based food colorings. Gingersnaps are my favorite holiday treat! Snowball cookies are the best and simple to make….. This year I am all about gingerbread. I love fudge! And trying new flavors. Have to say that good old fashioned fudge is my favorite holiday treat! I am a Southern girls so pralines and fudge are my most faves! Today I am trying your Red Velvet Truffles. I’m happy with a box cake, but your Oreo delight is great anytime of year! My favorite cookie is my mom’s Gingersnaps. Oh my and she is going to be with me this Christmas, so just maybe she will treat me to some homemade goodness! Love Pampered Chef! and Thank you for the tips on making Sugar Cookies! I love fresh coconut cake. But I never really met any sweet I didn’t like. And does Dec. have 32 days this year? Just messing with you. 🙂 Can I just substitute meringue powder for the egg whites in the icing? Thanks for the giveaway. Love Pampered Chef. Oatmeal raisin chocolate chip pecan – yes, all in one cookie. Chocolate covered peanuts are easy and delicious! Egg nog pounds cake with egg nog glaze is on the top of my list of Christmas treats! I just “liked” The Pampered Chef Facebook page, too! MY mom’s fruit cake cookies! My friends even beg for them!! My favorite Christmas recipe this year has been a Peppermint Cake. Yummy!! And I liked Pampered Chef on Facebook. Snowball Cookies! They have the texture of a shortbread and are delish with nuts & chocolate chips in them. Yum! My favorite Christmas cookies were the molasses cookies baked by my grandmother. Dark chocolate fudge with raisins and pecans. I “like” Pampered Chef on Facebook! Love oatmeal raisin cookies or peanut butter balls this time of year. Making sugar cookies with the grandkids. I love making blueberry pie with fresh berries from the garden! Liked it =) Can’t wait to try your cookie recipe! A new favorite at our house are the Nestle Toll House Chocolate Chip Cookie Truffle! I like the Dirty Snowballs that a friend of mine’s bakery makes. I liked Papered Chef on Facebook. Will be making your favorite sugar cookies tomorrow. Like the pappered chef on facebook. I like Choc cake with cream cheese icing and broken candy canes to decorate with. We enjoy anything “sweet” . . . chocolate chip cokies, chocolate cake w/cream cheese frosting, 7 layer cookie bars, wonderful oatmeal cake . . . the list goes on & on! Merry Christmas to everyone! Sugar cookies are my favorite at Christmas too! I love decorated gingerbread cookies. I’ve been baking some and handing them out to my grand daughters friends. They love them! Hope everyone has a very Merry Christmas! I love snickerdoodle cookies at the holidays. I love to make good old’ Southern Tea Cakes for Christmas. My family loves them! I “liked” the Pampered Chef Facebook page, too! The sugar cookies look so good. The Pampered Chef stuff looks fun, too. I love whipped shortbread – so easy! I like The Pamered Chef on Facebook. I “liked” The Pampered Chef on their fb page!! This year just doing Gingerbread cookies. Pampered Chef has some awesome stuff! Just saw too much that I want and it’s too late to let Santa know! My favorite holiday dessert is the classic Red Velvet Cake! Biscotti. I love biscotti. Oh, and snickerdoodles, too. And sugar cookies. OK, I love just about any type of cookie lol. MY FAVORITE HOLIDAY RECIPE IS ICEBOX FRUITCAKE AND LINZER COOKIES. Nothing beats a good Gingerbread cookie, but I truly love a gingerbread house. And they are NOT just for decoration. Eat the beast! It’s a difficult pick between peanut butter fudge and 7-layer bars. I liked The Pampered Chef and can’t wait to try this Sugar Cookie recipe sounds wonderful!!! Love to bake a Hummingbird cake for the holidays. I like Pampered Chef on FB. My favorite Christmas treat is my Mom’s fudge! German Sweet Chocolate Cake is my Christmas favorite. Great thing Pampered Chef is doing. I also have liked “The Pampered Chef on Facebook”. My Mother’s spritz cookies with icing & sprinkles. She’s 82 & still makes them for everyone. I just “liked” pampered chef on Facebook! My favorite Christmas treat is Red Velvet Cake!! I liked the Pampered Chef FB page. Love the cookies and The Pampered Chef Baking Bundle. Red Velvet Cake is the all time favorite to make. I make lots of other goodies also. Ive been making Sugar Cookies for two days now, My family is eating them faster then I can make them! I make my husband’s favorite cookies every year, snowballs! Iced sugar cookies are my favorite but mine always break. I’ll have to try this recipe! Yeaaa…I liked Pampered Chef on facebook! Looking forward to seeing what they post! I like my grandma’s butter tarts, fudge, gingersnaps — things I typically only have during Christmas! I love no bake cookies! Hope to win! I love double chocolate chip cookies with walnuts for the Christmas holidays. I liked the Pampered Chef’s Face Book page, good luck to all the entries! I love soft frosted christmas sugar cookies! Eggnog is my favorite holiday treat!! FB fan of Pampered Chef. I love Red Velvet cake, and The Martha Washington balls were the first homemade Christmas treat my 16 month old grandson Bladen was allowed to have..I posted pics of him eating them on my fb page, wish it had been a video so everyone could hear him going MMMmmmmmmmm….!! !The pampered chef pack looks awesome! I love snickerdoodles! They’re good with coffee, tea, egg nog, apple cider…just about anything! My favorite is sugar cookies with frosting! Thanks for a new recipe! My favorite Christmas goody is my MIL’s nut roll. It’s similar to your pecan log but uses a variety of chopped nuts and also dried cherries and mini marshmallows. Merry Christmas and thank you for your wonderful blog! Sugar cookies are my favorite and yours look extra Yummy! I “liked” the Pampered Chef FB page. Our Favorite Christmas cookies are “Spritz” made into wreath shapes with a cookie press. It’s not Christmas without them! I “liked” Pampered Chef. Thanks for the sugar cookie recipe! I’ve been looking for a good one. 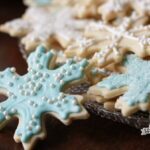 Sugar Cookies – best Christmas treat! I love this blog! Your baked spaghetti recipe is a big hit at my house! I love iced sugar cookies this time of year! My favorite holiday treat is my mom’s recipe Christmas cake. You have to make it in Oct or Nov at the latest so it can cure in Brandy. It is what makes the difference between a door stop and an enjoyable Christmas tradition. I also have been a PC fan forever and liked the page. My family loves peppermint bark and chocolate chip cookies. I love making oreo cookie truffle balls and candy cane cookies with family. sugar cookies with royal icing…making some tonight! I liked the Pampered Chef on FB. Your sugar cookies are absolutely beautiful. I’ve got to try this recipe. Thanks! I love archway cookies. It was a tradition when we were kids to have them when putting up the Christmas tree. Apple crumble with vanilla ice cream. Also a pampered chef fan. My favorite holiday treat is a mixture of chex, pretzels & Cheerios drizzled with iced white chocolate! Delish! I love fudge. Ok anything chocolate. I love The Pampered Chef so much I’m a consultant. I own Sugarmomma’s catering in Saskatchewan and our favorite recipe (and most requested) is the chewy ginger cookie! I love my Mother’s Divinity candy. She used to make it every year at Christmas time. I’m already a fan of Pampered Chef. I love their products. Sugar Cookies are definitely my favorite for the holidays. They are all so pretty! I will definitely give your recipe a try. I am already a fan of the Pampered Chef’s FB page. I like making Christmas wreath cookies. I too love the Pampered Chef so much that I’m a consultant. I really enjoy the “pampered chef” on facebook. Sugar Cookies are a favourite for Christmas time. My favorite holiday cake is my mom’s Red Velvet Cake!! My husband finally found his mom’s old sugar cookie recipe and he was very busy making delicious decorated Ugarit cookies! He was surprised about omitting the baking powder and will modify the recipe next time. Thanks for he tip!! My mom’s Christmas cookie recipe. No one makes them like my mom. I so want to make a beautiful sugar cookie but even yesterday, mine spread to where you could not tell what the shape was….I need this kit to help me in my kitchen…I want to master this sugar cookie!!! My favorite cookie is Egg Nog cookies. They taste like the real stuff! My favorite is spritz cookies…. Our favorites are old fashioned cut out sugar cookies like these and red velvet cake. Yummy!! I love the spritz cookies & Yule Log (Pampered Chef Holiday Cookbook)! I also liked the Pampered Chef’s Facebook page! My favorite is frosted cutout sugar cookies and homemade fruitcake! I love Pampered Chef and your cookies are beautiful. My favorite Christmas treat is homemade cheesecake-yum! I “liked” the Pampered Chef Facebook page. Pampered Chef on Facebook is awesome! My favorite cake to make at Christmas is a 3 tier Red Velvet Cake. The deep red color is so pretty. I add green colored sugar sprinkles on top. Favorite pie to make is pecan. My favorite cookie to make is a new recipe we made this year: Italian Sugar Cookies. Something I used to love making with my children was our yearly Gingerbread house. The Pampered Chef mold made a cute one! My favorite Christmas treat is homemade caramels. These are soft and easy to chew. They are easy to make and so delicious. Next to that is Cream Cheese Pound Cake. It’s a heavy pound cake that freezes well. I take the frozen cake out for company, slice as much as I need and return it to the freezer. Yummy!! Pampered Chef makes my baking so easy. I keep buying and buying more! My favorite cookie is the Swedish Ginger cookie from the Southern Living Cookbook. We decorate them with candied cherries and almond slivers. So hard to pick just one, but slice ‘o spice was always a favorite growing up. It is a sugar cookie type dough with oatmeal that you wrap in foil, refrigerate, then slice, coat with cinnamon & sugar mixture and bake. Yummy, now I’m going to have to make some! My favorite treat to make at the holidays are peanut butter cookies with snickers inside! So yummy!! I love peanut butter cookies. I also like Pampered Chef on Facebook. I liked the Pampered chef before. I love their products! I used to sell them too. Thanks for the recipe! It isn’t Christmas unless we have Crinkle Cookies – both chocolate rolled in powdered sugar and “plain” rolled in sparkley white sugar. I usually make one batch of decorated cut-outs to add some color to the cookie tray but everyone reaches for the old stand-bys. Sugar cookies are some of my favorites. Love to decorate them! I “like” Pampered Chef on Facebook. My favorite cookies are sugar and chocolate chips. Yummy. Wow! Beautiful cookies & great tip on how to keep the cookies from baking! I will definitely try this! Would LOVE, love, love to win this package!! Thanks for sharing! I’ll def. be back to your page! Sharing on FB! I am making the Favorite Sugar Cookies above. I can’t quite understand the need for 6 cups of flour. After 4 cups the batter was so stiff I knew I couldn’t add any more. Anyone got an answer? Hi Patti! Merry Christmas! If you used the 2 eggs and 2 cups (4 sticks) of butter, you’ll need all 6 cups of flour. Enjoy! I have a favorite pound cake recipe that I just love. Moist and rises high and mighty! I love making spritz cookies and peanut butter cookies with the hershey kisses on the top. “Liked” The Pampered Chef on Facebook. LIKED ON PAMPERED CHEF’S FACEBOOK PAGE…and just wanted to wish you and Pampered Chef folks a Very Merry Christmas! You’ve all brought JOY to me in 2012 and am sure 2013 will be just as fun. Thanks! Always searching for recipes that top my current favorites. Can’t wait to try this one! LOVE the Pampered Chef products and recipes. One of my favorites is Ding Bats, made with dates! Also sugar cookies! 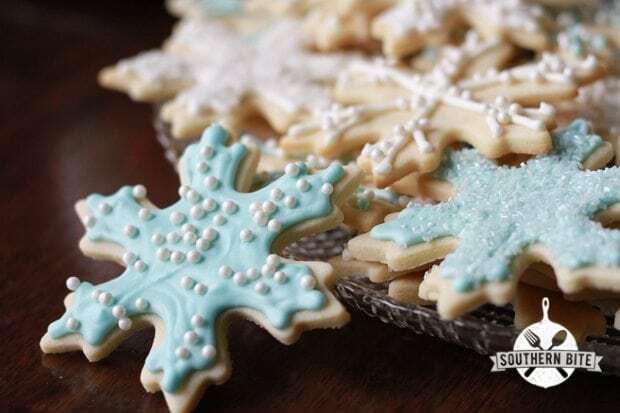 Your snowflake cookies are beautiful and I’m sure delicious! Today is snowflake day …a perfect day to try them! WoW snowflake cookies are soo beautiful and look so yummy, I immediately printed the recipe and going to invite my first and only granddaughter (Zara) over and make them with her, she loves spending quality time with “grandmaman” Thanks for sharing Pampered Chef Recipes Christine, you are the Best and always there to help when I need it in a flash. These new tools would work very well with my grand daughter and I. Would be nice to win! My Christmas treat is a breakfast family tradition in my family on Christmas morning, Goldenrod Eggs. A recipe handed down by my maternal grandmother, it is a favorite of my grown sons. Snickerdoodles are my favorite christmas cookie and Russian Tea Cakes. And I will “like PC on FB” , One of my absolute favorite kitchen products. We are definately a cookie family. But, my favorite is oatmeal chocolate chip pecan! Yum!! Didn’t think about doing that before, thanks! I love their products. Soft and Chewy Sugar Cookies, love these and love to make them. Soft and Chewy Sugar Cookies, love these and love to make them. I also Like Pampered Chef on facebook. Snickerdoodle FOR THE WIN! And a tall, ice cold glass of milk…. YUM! I love Sugar Cookies, and I must bake these. I have always admired Pampered Chef products, but have never been to one of the parties. Would love to own something of their line and use it to impress my family. My favorite homemade cookie is Jerome Bars. My mom made them as I was growing up. So good. I also love Orange Slice cake at Christmas along with the usual Red Velvet, Italian Cream, etc. I do love Sugar Cookies though and am very happy to have your recipe and hints. extract. Makes them delicious with just a hint of different flavor. For quick and easy, I make Conversation Cookies (no cooking). Can be used for any type get together. I also enjoy Oatmeal Crispies .and make them often as everyone enjoys a crisp cookie. I entered, and the Pampered Chef website is awesome!! I have been using Pampered Chef for 20+ years! Love, love, love it!! I just entered and the pamper chef page is amazing!! !